Belthangady, Mar 15, 2017 :Sandesh (23), the driver of a private bus which was heading towards Madanthyar from Uppinangady on March 14, Tuesday sustained burn injuries when the mobile phone in his shirt pocket exploded suddenly. The incident took place at Alake near Madanthyar when the bus had stopped for passengers to get down. For a moment there was panic around. However the driver with great presence of mind, took off his shirt which was on fire and threw it away. 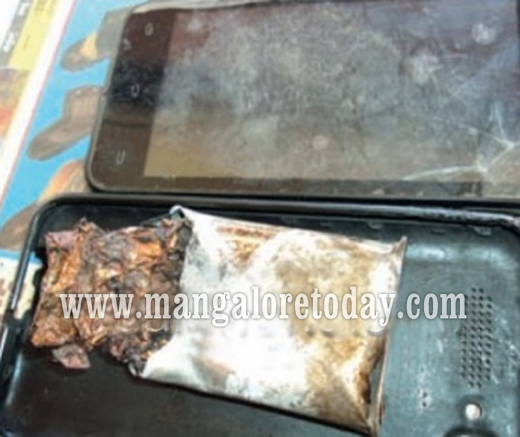 The battery of the mobile phone was completely destroyed in the explosion. Later, Sandesh was rushed to the hospital in the same bus with the help of another driver. It has been gathered that Sandesh had bought the Intex smart phone a year ago. Every product has a limit too much is too bad . So many case of explosion of cell phones have happened recently .What is the reason for this? How safe is carrying mobile phones with us?